Over time, the musicians you revere can have their image changed in your eyes. Some of the touring underground bands that I admired during my 20s seemed, in retrospect, to have more in common with me and my music pursuits than I thought. The only real difference was they were in a bigger city and there was a label backing them up. Sometimes superstars turned out to be not so super. John Lennon, in all his infinite wisdom, might qualify for what some people would call a deadbeat dad. There was also at least one older musician I met that seemed to be more interested in making inane banter with young ladies than talking about music. And some people are just batshit crazy. Everyone's entitled to be batshit about some thing - the type of food they eat, the way a soundcheck should go. But upon reading yesterday that Exene Cervenka - the once and forever vocalist of X - went on at length saying that last week's shootings in Santa Barbara were a hoax, I started to wonder if the woman who helped alter my listening habits in 1980 (which really did change my life in the following years) is crazy in a bad way. I didn't realize there are people who had this mindframe. I thought the people that would deny history were the ones who didn't believe in the Holocaust, a belief based out of hatred. Reading that really messed up my morning yesterday. It felt worse than realizing that Mr. Anti-Capitalism Jello Biafra had ripped off his ex band. Not bad enough that I'm ready to get rid of my X albums (the first four of which are autographed!). But enough to make you feel really odd. But just now, I discovered that Exene had backed down from her original statement - sort of. Here's an quick article about it. Reading the post on X's Facebook page actually makes me feel a little more relieved. It also serves as a reminder that people might not always be as extreme as they're perceived. But the thing that really bothers me is that anytime a musician speaks up about something like this, good or bad, there's always some idiot online who has to counter with, "they're just saying that because nobody knows who their band is, and they're just trying to get publicity/make money." I almost find it more offensive that people think that it always comes down to money. That's all we care about. All of us. But I guess when you sit at home all day and do nothing but surf the web and comment on stories, it's easy to get in the mindframe. I'd stay and try to type more but I need to have breakfast and get ready for work. The conversation continues from the previous entry, where Tork talked about songwriting. I owe a lot to my piano lessons. At one point I switched from playing Beethoven and Mozart to theory. And I learned how to spell chords, you know like, “what’s an F# minor chord?” and when I took up guitar I would say, “OK, what’s the next note in such-and-such a chord above the note on the string? How many frets do I have to get up to, to play a note that’s in the chord I want.” And I came up with some unusual formations too, like that add-4 chord I mentioned earlier. I couldn’t have predicted that I would live to be 40-plus myself! Well I’m glad you did. But at the time, what was the view [of the music and the band]? How did you guys think? “This is fleeting. It’s just going to last a couple years”? What did you think? [Takes a breath] I did not think. I did not think past…I knew it was going to be big before it happened. I could just tell that it was lined up properly. It wasn’t surprised. But as to the longevity, I really hadn’t given it any thought. I still don’t much. Right now, the Monkees are on tour, or we will be starting tomorrow night. We’ll be doing this for about three weeks, I think, more or less. There is some talk amongst us of doing something else this fall together. But that’s as far ahead as I think. Other than that, I like to sit at home and play piano and write stuff. I have a blues band. This coming January, I’m going to be going down to Lexington, Kentucky. I’m going to have them play a piece I wrote for piano and orchestra. It’s fairly brief. It’s seven minutes long. They’ll be doing some pop music, it’s a pops orchestra. But I’ll have them tackle this thing I wrote. It’s not easy. So that the thing: what’s next on my agenda. I don’t pay too much attention to what goes on ahead of me. I have started to wonder if I’m going to outlive my money or not. That’s what you start to think about when you reach my age. But I ain’t dead yet, and I’m not taking drugs. Well it is great that you still out there playing shows. Oh yeah, man. It’s fabulous. I’m a very lucky guy. Extraordinarily lucky in many, many ways. Turns out that I have an extraordinary constitution. I get over being sick about twice as fast as anybody else with the same diseases and the same troubles. So I’ve gotta thank whatever source I’ve got. Say thank you, that’s all I can do. When you and Mike and Micky got together for rehearsals, I think it was about a year and half ago since the first ones, what was that like, having the three of you all together again? It was good. It was interesting. Michael sounds almost exactly the same as he did back then. Micky sounds hardly different, a little bit. But he’s still one of the best pop singers of all time. Michael’s voice is resonant and clear. It kind of swept me back to the day to hear Michael sing the songs that he sang, the way that he sang them. I found out I was a little more nostalgic for the old days than I would have guessed, if anybody had asked me beforehand. In some of the shows that you’ve done, there’s been a tribute to Davy in it. As an audience member, I could see it being really emotional. And you guys are doing it night after night. Does that take something out of you? How does it feel? No. An entertainer’s mindset is not very well understood by people who don’t do it. But you go to work every day, you do something almost every day. And day in and day out and day in and day out, you never go, “Oh my god, I did this yesterday!” You just do what you do. And entertainers really have to look at their work that way. Nobody, there are very, very few of them. Robin Williams did routines. He did most of the same show night after night. And he’s one of the fastest, cleverest, funniest people you’ve ever heard of. And he doesn’t do all brand new stuff every day. He does routines. And you do them. The same thing doesn’t happen for us that happens for the audience. We do the tributes. And the audience goes, “Oh, my god, that’s right!” But we did the tribute last night as well. You know: an actor doing the same show on Broadway, day after day, night after night. He better find a way to make it real every night. It better not be the same thing he did last night, or he’s going to be dead. It’s going to be a short run. There are skills that are involved with this business, and you have to learn them. Mike, we have only a couple minutes left before I have to run away, I’m sorry to say. So if you have one more blockbuster question, now is the time! I do! When you look back on the movie Head, what do you think of it? I have…you’re going to have to listen to Torkelson’s Theory of Theatrical and Cinematic Criticism. If the point of art is to bring you forward, to carry you on, make life worth living, or at least to give you something to make you work towards, what happens to the protagonist represents the creator’s point of view. And when the protagonists start off lost in the water, and they end up lost in the water, there’s not a very good message in that. That message is: You don’t get out. The cycle just keeps on going, it’s not good and you’re always trapped. From that point of view, I think Head is an inferior movie. Technically, of course, it was advanced. Columbia Pictures had never released a movie that avant-garde, at least not for a long time. What was the movie that they did, I think it was with Gregory Peck and Ingrid Bergman in a psychological thriller. There was a sequence that Salvador Dali had a hand in creating. It was very strange, very far out. But other than that, I don’t know of anything in the movies that was as far out as the solarization techniques and so on. So you have to give it to Bob Rafelson for that side of things. I think we get points — the Monkees, as an operation which includes the producers, directors and all that. I think we get points for taking the Monkees out of the tv series. We didn’t want to do another episode of the tv show. I think we win points on that respect. But I think you’re supposed to make a movie that either says how awful it is to be caught in a loop or [says] you don’t have to be caught in a loop. That movie didn’t say that. All it said was, “You are caught in a loop.” And that’s not a message I need to give to my children. So our time has come to a close. Thank you for asking the big question. I’m sorry we can’t carry on. The reunited Monkees - Tork, Micky Dolenz and..........TA-DAH! Mike Nesmith - are performing at the Palace Theater in Greensburg, PA this Wednesday, May 28. (8 p.m. $65-$95. palacetheatre.org). Last Wednesday, I had a chance to talk to Tork, something I've wanted to do for years, knowing he was a lot sharper than the character he played on the show. We spoke for 15 minutes, which means we couldn't get into deep questions like specifics about the Head recording sessions or the fact that my uncle was on two episodes of the show and whether or not he remembered him. But I also avoided the usual questions about whether or not the Monkees were a real band. This is the first installment of the uncut interview. More will come in the next day or so. PS, while the title is obviously true it's also a reference to part of Head. Is music something you always wanted to do or was it something that you just stumbled into? I can’t tell you for sure. I think I’ve always wanted to be an entertainer. And I always wanted to be a musician. But I’m an entertainer first and a musician second. I took piano for five years, and played banjo and guitar and bass and everything ever since. I love music, but I’m just not really sure that I’m as good as I ought to be if I’m gonna be, like, someone who you go to hear play music. But I am good enough that you should come and see me if you want to have a good evening with some good music stuff going on. So I have to say music has been sort of a secondary thing to what I’ve always really wanted to do, which is to be an entertainer. I can see how being on a tv show like The Monkees would factor into that. You get the best of both worlds. It’s a good question: whether I became a Monkee because of my attitudes about this or whether being a Monkee postured or spurred. If I hadn’t been chosen for the Monkees, I probably would’ve been a folk singer for the rest of my life. Like a…I don’t know, I can’t even think of any guys that are like this. Tom Rush, who was a figure from my youth, very good folk singer – like that. When you were in Greenwich Village…. A lot of people that I think of from that time, Phil Ochs or Dylan come to mind, seem a little more serious where the music or the message came first and entertainment might’ve been secondary. Yeah something like that. It’s hard to tell. Phil, of course, is no longer with us. I have never heard from Bob Dylan, one way or another, on the point. Although he’s not a very good entertainer. [We both laugh.] I don’t know what he was up to. I think he was about… he wanted to be part of this, and he felt safest and best when it came to worthsmithing and writing lyrics. So that’s where he went. I didn’t write much. I’ve written some good stuff here and there. But nobody thinks of me much as a songwriter, particularly. So each to his own. Phil Ochs, like Bob Dylan, got to thinking that the message was the important side of things. I think Phil was a little more musical than Bob was, or is. But you make your own choice. You follow your own proclivities. I have to say a song like “For Pete’s Sake” still really packs a whallop all these years later. I wrote a set of chords once and thought, “Gosh, this is great.” I couldn’t think of anything to do with them. A couple years later I wrote “Can You Dig It,” to those chords. They were… let’s see: D-minor to B-flat major 7th to an E diminished 9th chord. That’s a really interesting way to set it up to the V chord. Or to look at it another way: we’re in A – Arab scale, which is – I don’t want to get too heavy. But it’s an unusual scale in Western music, in pop music. And it worked fine for me. I was just really glad. It just fell out of my hands again. It really felt good. So I’m pleased that I’m not just writing “moon/june/spoon” songs in doggerel. My girlfriend says that if you can sing [your tune] to “The Yellow Rose of Texas,” it’s doggerel. Look up the word: doggerel. I forget exactly what it means, but I know it’s not good. It’s cheap poetry, with no thought given whatsoever to rhyme or tension. Bad stuff. Completely thoughtless. The title of this post comes from something I said to my friend Jennifer during Death of Samantha's set at Mr. Small's last week, when they opened for Guided by Voices (and nearly blew them out of the water in terms of delivery and finesse). Doug Gillard's guitar work was astouding: one handed guitar solos, fat power chords, picked open chords. The man has it down. I was hoping to follow this praise with a link to a review of the whole show that I wrote for Blurt, but it's not up on the website yet. However, I hadn't posted my profile on Mr. Gillard and his latest release, so now you can check that out right here. In other Shanley On Music news, I interviewed none other than Peter Tork of the Monkees on Wednesday. I didn't think it was going to come off, as past attempts to secure a Monkees interview eluded me. The band is coming to town (actually to Greensburg) next week, and I hope to have the whole interview transcribed and posted here within the next day or so. Keep looking. Teaser: I avoided typical Monkees questions, and Peter was a really great interview. Nice fella. Beyond that, bad allergies knocked me down for a day this week. There's a crap ton of reviews I have to write by Tuesday. Gotta run. Open it up, and there was a glasses-less John giving the raspberries to the camera. The back showed him with several pairs of specs on his face, presumably to make up for the lack of them inside. If that care-free design wasn't enough, it came with a booklet that had lyrics to each song, with more drawings from John's youth, and instrumental credits for each song, on which the ever-cheeky songwriter employed pseudonyms like Rev. Thumbs Gherkin. Eide's seemed to have everything an eighth-grade burgeoning record fanatic could want. Over the next few months I'd purchase Japanese reissues of George Harrison's mediocre solo albums Wonderwall Music and Electronic Sound, thinking that I was actually purchasing the original copies. But on that December day, I found the object of my search - Walls and Bridges. Ha cha, I thought. Only something was different. I figured it wasn't going to be on Apple Records, but I didn't mind the Capitol label. But not only did it lack the original gatefold sleeve, it didn't have any lyric book in it! The front was a non-opening reproduction of the original. The back included all the studio technical credits, but no mentions of who played what, no Rev. Thumbs, no mention of Julian Lennon's ragged but right drums on "Ya Ya." All of this occurred to me a couple weeks ago when I decided I needed to have an original copy of Thelonious Monk's Monk's Music on Riverside. Now, I do have a later pressing of the album already, I confess. But it doesn't have the original cover - of Monk sitting in a kid's wagon with a briefcase and sheet music, decked out in his cool shades. Plus the later copy is one of those "electronically rechanneled for stereo" abominations. So an original was in order. A few years later, I traded in Walls and Bridges when I needed money. Then I picked up a copy at a yard sale - an original with all the trimmings. In retrospect, it's not a great album, aside from a few songs. I might've played it three times since it got it. I've thought about unloading it, but even if I don't, it's still fun to look at. On this album, he brings both worlds together, by having Marsalis join the quartet for two tracks - one of them being a free improvisation. 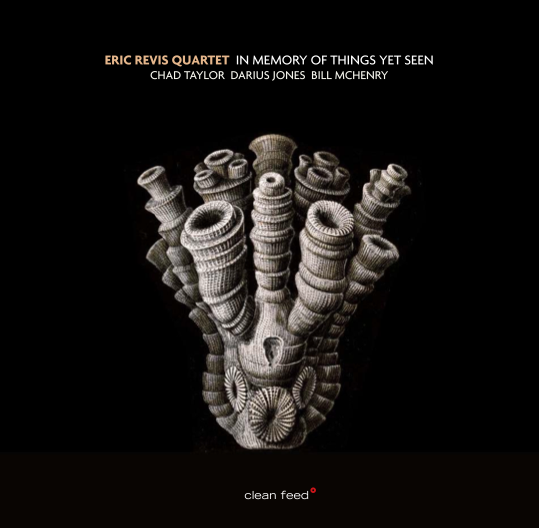 The rest of the album features the bassist leading alto saxophonist Darius Jones (a wild player in his own right), tenor saxophonist Bill McHenry (who can either maintain solid ground or leave it, and does both here) and drummer Chad Taylor (an extremely inventive percussionist who has played with bands from Chicago and New York too numerous to mention). Revis wrote the majority of the album's 13 tracks, but everyone in the quartet also gets a chance to contribute at least one composition. Three tracks come from different sections of the bassist's "The Tulpa Chronicles." Spread throughout the album, these brief segments create a tone poem with soothing, droning vibes, offer reedy counterpoint and riff over a bowed bass line, in that respective order. Jones might be expected to deliver one of the wilder pieces, outside of the group improvs, but "Hold My Snow Cone" sounds rather restrained, a steady beat on the snare framing an intriguing mood that sounds somewhere between a soul slow jam and indie rock. Along with the originals, Revis makes some sharp choices for covers. Sunny Murray's "Somethin's Cookin'" is not as shambolic as might be expected, thought it swings freely with a some solid bass underpinning it. Sun Ra's "The Shadow World," on the other hand, gets really wild and free, with a fiery sense pushing it along. If only Branford joined them for this one. Marsalis does blend right in with the quartet, though. "FreeB" the five-piece blast of spontaneity, lasts just over two-and-a-half minutes but doesn't waste any time. Methinks the guest is the one blowing long tones underneath the other horns. In some ways, its brevity makes it seem more like a warm-up, but that also keeps it in line with the other tracks, most of which last under four minutes. Marsalis' other appearance, ironically called "Unknown," almost sounds like hard bop initially, but the saxophone solos, especially Jones' fiercely melodic contribution, aren't tethered to changes and play loose with the rhythm section. The coda riff, which gives Taylor a brief chance to stretch out, sounds like the kind of groove that would get an audience screaming their approval. Then again, that reaction could happen during nearly all of the tunes on this album.